Softcover available on Amazon here! Welcome to Simply Cursive – Style #1! After the release of my Create Your Own Penmanship Pages ebook series, I had so many contact me asking for a cursive ebook. I listened and now have completed the first in this series. This ebook is divided up into two main sections: the Cursive Lessons and the Extra Practice Pages. 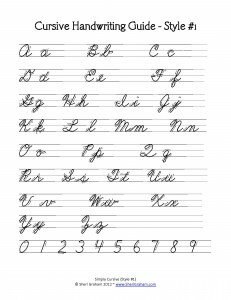 The Cursive Lessons have been grouped together so that your child will learn similar style letters one right after the other. After every five or so lessons is a Review lesson to reinforce what has been learned so far. Each lesson has a couple lines for your child to trace the letters, then additional lines to copy and write the letters on their own. I also used the font with arrows so your child can easily see how to write each letter in cursive. You can do one lesson a day or divide it up over two days. It really depends on the age of your child and their readiness to learn cursive. As the parent, you decide what is best for your child! The Extra Practice Pages include selected Bible passages for your child to copy in cursive. These pages can be used however you feel is most helpful, having your child write out the whole passage in one sitting or dividing it up over several days. I have also included a few lessons to practice writing numbers. Since some choose to teach their children cursive before printing, I decided to include some numbers practice as well. How to use this ebook: As stated above, you can do one lesson a day or divide it up and do one lesson over two days. If you do one lesson a day plus use some of the Extra Practice Pages, your child can work through this ebook in one semester. If you decide to take things a bit slower and do one lesson over two days plus some of the Extra Practice Pages, your child will take close to the whole year to complete it. You may wonder how I came up with my title for this series: “Simply Cursive”…well, I think as with many things we teach our children, we make things too complicated and complex. I wanted to provide a cursive ebook that would be simple to use and reasonably priced (especially since it can be printed and used over and over!). I hope you and your children enjoy it!